But before I get to that, just know that you’re fully capable of lowering your blood sugar. With a little bit of diligence on your part and paying attention to what your body is telling you, you can get things under control. I know it can be discouraging at times. But even though I don’t know you, I’m sure you’ve overcome many obstacles or challenges in your life. And type 2 diabetes is no different. 1. Check your blood sugar. I mean really. Check like crazy. I recommend before meals, and 2 hours after meals. Then I recommend checking before bedtime and upon waking hours in the morning. 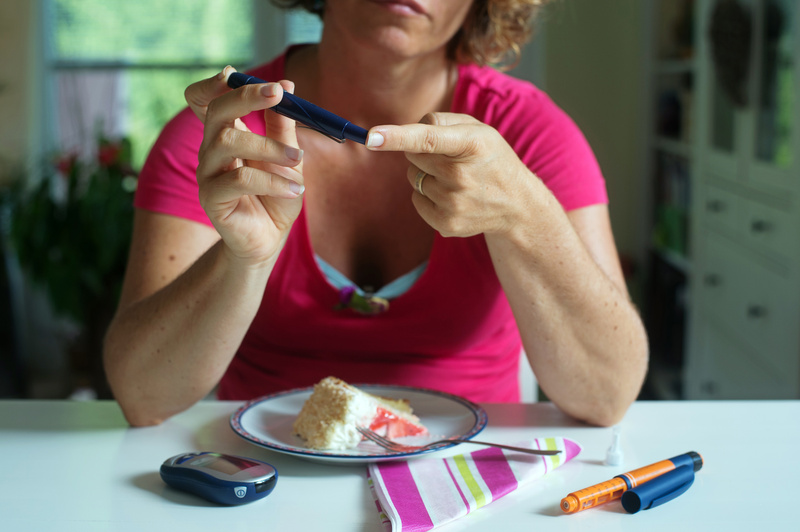 When you have very high blood sugar… you have to know what is going on with your body. Also you can get an idea of what is working and when your blood sugar is the highest. This one piece of advice has helped so many people it’s not even funny. There are ways to check your blood sugar that make it so easy you’ll never fret about testing. I’ll tell you more on that in a minute. But testing is really the Key to getting your blood sugar levels perfect again. 2. Eat foods that lower blood sugar. 3. Cut out the sugar. Cut out the candy, cakes and stuff like that for now. Avoid soda and juices. Stick with water until you get your blood sugar under control. Water is powerful and will help to dilute high blood sugar (Drink half of your body-weight in ounces). We’re not talking about cutting out sugar forever, although it wouldn’t hurt. But just until you get things under control. No one wants to hear the dreaded word “DIET.” And I don’t blame you, but when your blood sugar is high it calls for drastic measures. In fact much of the literature speaks of how toxic sugar is to your body. And even link sugar to diseases such as cancer. Sugar comes in many different forms. Some of the foods that you think are healthy really aren’t. And disguise sugar in the name of words like high fructose corn syrup. And try to stick with foods that aren’t processed. If you really need something to sweeten up teas or foods…use Stevia. It even LOWERS blood sugar as I mentioned above. Be careful though because when your blood sugar is too high it can be dangerous to exercise. When you do exercise, try strength training and cardio exercises. Exercise reverses insulin resistance and helps your body use insulin more efficiently. Even if you just walk around the block, you will do yourself a world of good. You don’t even have to go to a gym. Whatever it takes we have to get your blood sugar down and physical activity is excellent. Building muscle is one of the best ways to improve your blood sugar quickly because muscle requires more energy (glucose) during resistance training activities and even at rest hours later. And this can be done in short 15 minute spurts. Try calisthenics for starters. Flex those muscles! 5. Control carbs by monitoring the carbs you’re eating. Look at starchy carbs like rice, bread and pasta and see what they do to your blood sugar. Try more fruits and vegetables instead of these starchy carbs. And when you do choose these starchy carbs, choose whole foods instead of refined foods like white bread; opt for brown rice instead of white rice; and sweet potatoes or whole potatoes over mashed potatoes. Refined carbohydrates can really do a number on your blood sugar. And when you do choose fruit and other forms of carbohydrates, choose those with a lower glycemic index. 6. Speak to your doctor about your medications. Sometimes doctors put people on drugs that don’t work anymore. If your pancreas isn’t secreting enough insulin, there may be other options available that you may need depending on how diabetes has progressed. It may be time to switch things up with the medications you’re taking. Fiber can be found in fruit and veggies and has many benefits. I wrote an article on how fiber and eating foods high in fiber have been tied to less diabetes. Some great ways to quickly get your blood sugar down to normal ranges. I hope you found these helpful… Not only do these flat out work, but they’re simple. Because blood sugar spikes are not healthy and our bodies aren’t designed to deal with them. Ideally, you want a sustained blood sugar release, which doesn’t cause a corresponding insulin spike. 1. Peanuts I always keep a bag or two on hand when we go on trips. 3. Low fat Milk not as good as the above. Pressure is too high and cant get doctor appt for 3 months earliest. please help thanks. When do you test? And what are you eating? Are you testing often enough? My guess is that these readings are after meals. It sounds like you might be a candidate for insulin therapy as your current medications may not be getting it done. Will it work when taking medication for high blood sugar? I have been walking no good results in lowering my sugar. Doctors should at least give these tips to lower blood sugar instead of giving you medicine. I believe the body get hooked or use to diabetes medications. I really thought this article was about emergency measures to lower BG, si was disappointed. The article contains good advice, however nothing to quickly (30 minutes to an hour) lower BG. I know at least 4 ways to quickly liwe BG in an emergency! First: drink an ounce of straight low sugar type of alcohol, such as straight vodka or gin or 2-3 ounces of very dry (almost sour) white wine. The idea is to have the alcohol with as little carb as possible. The liver, which makes glucose, will think it has been poisoned by the alcohol and will stop working on anything except removing the alcohol and the blod sugar will drop. Second: As soon as the alcohol has been drunk, drink 2 eight ounce glasses of water. Climb into a very hot tub of water, such as a hot tub or spa tub. A bath tub will work for ths though. Then 10 minutes after the 2 glasses of water, drink another glass of water. ( This helps dilute the sugar in the blood ) As soon as possible, urinate. In the tub is ok and you can sanitize it later. This will remove some of the sugar from your bloo. NEVER do this without an attendant to keep watch. You could go hypo and pass out from the blood sugar going too low. Many people passed out while drinking in hot tubs and drowned, back in the 1970s when hot tubs were first popular, which is why they now say never drink in a hot tub. Test your blood sugar often! So that you know what various foods cause problems for you. My high after eating occurs 45 minutes after, not the standard 2 hours after eating. Find out where your high point is by testing before you eat then every 15 minutes after, for a period of 3 hours. You only have to do that once, as it is to determine where your high point is located. Then use that high point as a reference point for testing after eating in future. Weight lifting helps long term, for type 2, if you have insulin resistence, because it tears down old muscle, which is insulin resistant and builds new muscle which is not insulin resstant. Ditto for losing fat. The fat cells can also carry insulin resistance, so reduce them and you reduce insulin resistance. I eat a very low carb diet, so unless someone serves me a regular coke in place of a diet one, (as an example) I simply do not go high. But this was not always the case. I used to eat a different diet and got no exercise and that different diet (higher carb/low fat) kept me constantly fighting high blood sugars. My first A1C was 13+ but my last (last month) was 5.0, which is not even pre-diabetic. I am still diabetic and always will be, but I control it with diet, exercise and metformin. This is good information. Thanks. My blood sugar measuring 20.1, what should I do to reduce it, and I am not on any medication, whT can happen if no further treatment. my fasting blood sugar is 133 on metformin. is there something else I can take to help reduce it? First, I’d recommend speaking with your doctor. Maybe the medication that you are taking is no longer working. Sometimes this happens depending on the progression of the disease.